It is that time of the year again – the time when all hell will break loose in the war for undergraduate admissions in well reputed universities across the country. Tons have been written about the complexity of the admission procedures of the universities and the intricate backdoor entries into several schools; however, a new story has transpired this year in the Medical Colleges’ admission tests in the name of curbing the ‘coaching businesses’. Every scholarly individual including the likes of Dr. Muhammad Zafar Iqbal has expressed immense concern for the ‘over-generalisation’ of the results and evaluation methods of the secondary and higher secondary levels. In simpler words, the superfluity of GPA-5 has posed a threat to the fostering of proper talents in higher education albeit the statistics look wonderfully supreme each year adding scores to incumbent administration (whoever that may be). Thus, instead of a few hundred good students, universities face a standoff among fifty thousand or more students who all ‘appear to be’ equally talented given their transcripts. This year, the glorious GPA-5 was secured by a total of 51,469 students which is the highest grade point average, from eight general boards. The number of GPA-5 achievers increased by 17,084 this year compared to that of the previous year (which was 34,385 students excluding the Madrasas and Technical Boards). These rising numbers have always been used to illustrate the success of an administration and to tout the pedantic success of whoever is running the government. The colourful display of victorious sign waving GPA-5 winners lasts for a day or two. After the obstreperous display on July 19 (the day the results got promulgated), the students went back to their study tables and are preparing for another bout which is even more rigorous – the admission wars. We have already seen the upsetting situation in BUET (for other reasons and remote to the admissions). However, the defamation of BUET casts doubt in the eyes of other institutions because BUET has been known for the most transparent institution in regard to admissions and a decent evaluator of student aptitude. They have forever been the touchstone for other institutions in measuring their own standards. On that note, the latest farce came along on August 6, 2012 when Principals of twenty two government medical colleges and two private medical colleges sat for a meeting in the Ministry of Health where they devised a ‘scheme’ to combat the ‘coaching business’. Even though the intentions are splendid, the propositions made on the meeting seemed very outlandish and many a scholar will speak in contrary to their argument. According to the daily Prothom Alo (August 6, 2012 – cover page), the Principals decided that there will be no such thing as ‘admission tests’ for MBBS and BDS degrees. It should be noted that, now both government and private medical colleges go through the same admission test I order to maintain congruity. Even though the proposition was not unanimous, it was reported to have gained the majority of support and a formal proposal was submitted to and accepted by the Ministry of Health and a meeting to finalise the issue was planned to be held on the August 12. It was further reported that, the Principals argued (in the meeting) that the culture of 50-60 thousand students competing for seats in the Medical Colleges needs to be restrained. In order to realise this aim (along with combating the coaching culture), they mentioned that BUET faces only three students against one seat in their admission test; and the way BUET succeeds in doing so is by maintaining a very demanding threshold of grade point in their primary admission applications. On the contrary medical colleges face about 50 thousand applicants against three thousand seats. 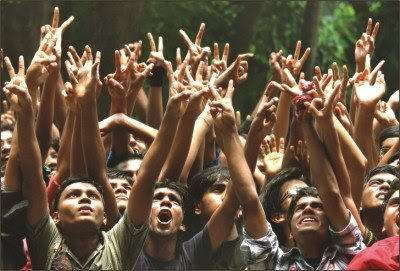 Alas, the Principals then forgot all about BUET (after stating BUET as the touchstone) and proposed that admission tests be dismantled completely; however, maintaining their threshold for application of grade point of a mere 8.0 (covering both SSC and HSC), whereas it is a demanding 19.0 for BUET applications. The threshold is less than half of the standard they were stating (of BUET) and had they pushed their threshold to a higher grade point, the myriads of applications would have lessened. This begets the credibility of the transparency of the whole scenario. It is common knowledge that medical college admission test question papers often get leaked, notably in the academic year 2006. Recounts of students staying overnight at dark and stinky coaching centres to accumulate question paper for the next day, reached the media that year. The ‘leaked’ question papers were told to be ‘sold’ at rates of three to four lac taka in 2006. In spite of the uproar in the media, no steps were taken to remedy the situation that year. Similar deplorable cases were presented in latter years as well. This further engenders the question – are the medical colleges trying to fix a prevalent problem that vilifies the entire system by getting rid of the admission test in its entirety? Shah Abdul Latif, Director Medical Education & Health Manpower Development told daily Prothom Alo that the majority of the Principals agreed upon the idea that, since the SSC and HSC are being held in a judicious manner, the public examination results prior to the admission test is sufficient to evaluate proper candidates for MBBS and BDS. He also mentioned that students who have done well regardless of their optional subject will get preference. On the contrary, he further asserted that subjects relevant to the discipline i.e. ‘Biology’ will get emphasis. However, it seemed that he was not privy to the knowledge that ‘Biology’ itself comes as the ‘optional subject’ in almost all candidates’ transcript. After the meeting on August 6, the grim culmination of the apprehension of thousands of medical college candidates was reached on Sunday, August 12, 2012 when the Health Minister AFM Ruhal Haque presided over the meeting in question (at the Health and Family Welfare Ministry). The resultant press briefing of the meeting said, “The process of admission to both government and private medical colleges will be controlled centrally (based on GPAs of SSC and HSC).” The Minister maintained that the public examinations are standard enough to pick students by GPAs for medical colleges. However, the detailed protocol of the selection process was not promulgated in that meeting rather it was assured to the media that the formal protocol will be “finalised shortly” (reported by UNB). The news was not well received by the candidates and the scholarly community. A former President of Bangladesh Medical Association (BMA) and former pro-vice-chancellor of Bangabandhu Sheikh Mujib Medical University, Professor Rashi-E-Mahbub told the media, ”If competent candidates cannot enroll into the medical colleges, then it will be a great shame for us.” He further asserted that the government’s decision might have stemmed from the apprehension of question leakages and the fear of not being able to conduct a transparent admission test (reported by BDNews24). The candidates were anything but acquiescent. 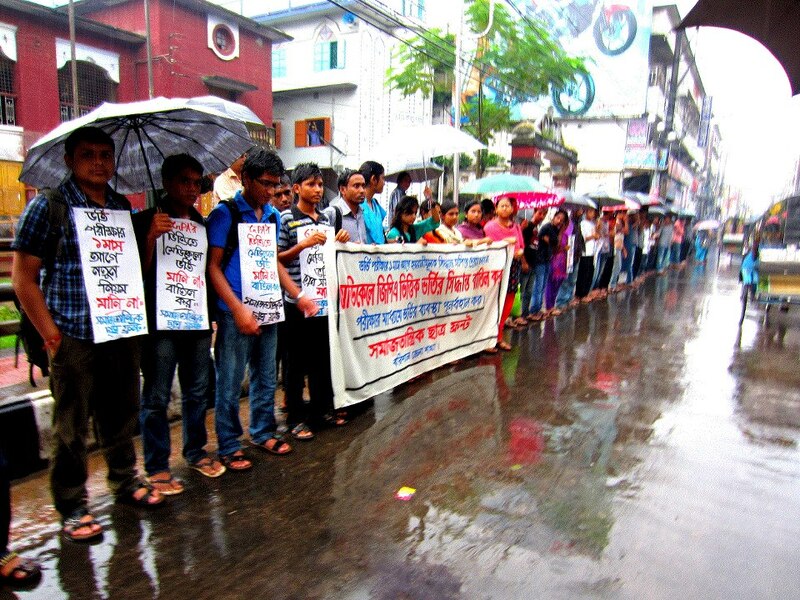 On August 12, a human chain demonstration was held in Chittagong with more than 50 students from Chittagong College, Haji Mohammad Mohsin College, Government City College, B. A. F. Shaheen College and Navy College. 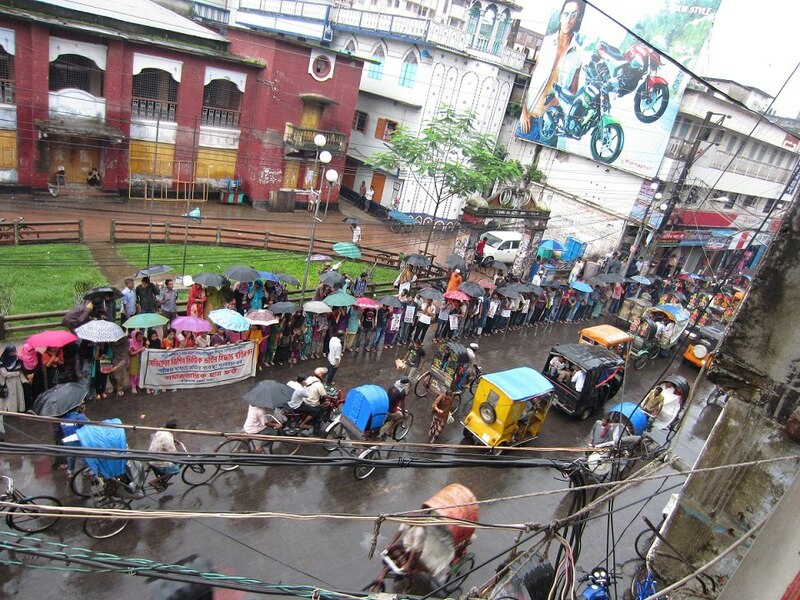 A similar demonstration took place in front of Comilla Town Hall on the same day. Later, in Dhaka, the candidates (along with guardians) held two human chain demonstrations – one in front of the Central Shaheed Minar and another in front of the National Press Club on Monday, August 13, 2012. This situation has left the candidates in a precarious situation. Fahmid Akbar, a candidate who has passed HSC this year with GPA-5 (and was one of the demonstrators) asserted, “After reading about the cancellation of the test, the whole situation has become uncertain for us.” He further stated, “This decision would make sense if it was applicable for students appearing for SSC next year but for anyone who has already passed SSC, the decision is ominously unheralded.” “If the decision is not reversed, many of my friends who have worked tremendously in the past few months will lose any chance of becoming a doctor,” said Farida Yasmin who secured GPA-5 from Chittagong Board and is living in a hostel in Dhaka for tuition and admission procedures. At this point, it will not be callous to question the credibility and rationale of the step that is being taken by the Ministry of Health regarding the medical college admission procedures. Any step taken to combat the coaching culture is indeed welcome and rather necessary but not when it is to cover the failures of a specific wing of the system. By abolishing the admission test, students who could not do well in SSC and HSC (notably students from rural areas, even though it was declared that there will be a 20% quota for them) will be deprived of a chance at becoming a doctor which till this day remains the dream of majority Bangladeshis. Furthermore, students who have passed O-Level and A-Level will also be in a perilous state. Thus, if BUET is the standard for admission procedure, then the concerned Ministry might as well adopt the procedures of the exemplary institution instead of founding a novelty that is privy to further corruption inside the education boards, since the students are not aware of their ‘raw’ marks themselves; all they have is a letter grade called ‘A+’. Decapitation can never be a solution for a headache; instead it is high time for the medical admission system to earn an ‘A+’ for themselves.